Around 50 people were injured and at least 12 hospitalized after a train going from Moscow to the Belarusian city of Brest collided with a commuter train, the Russian Investigative Committee says. A conflicting report from the Russian Emergencies Ministry states that 15 people were hospitalized, and seven have already been sent home. Four carriages were derailed on Sunday night, with one turning upside down and visibly damaged, as seen from footage filmed by eyewitnesses. 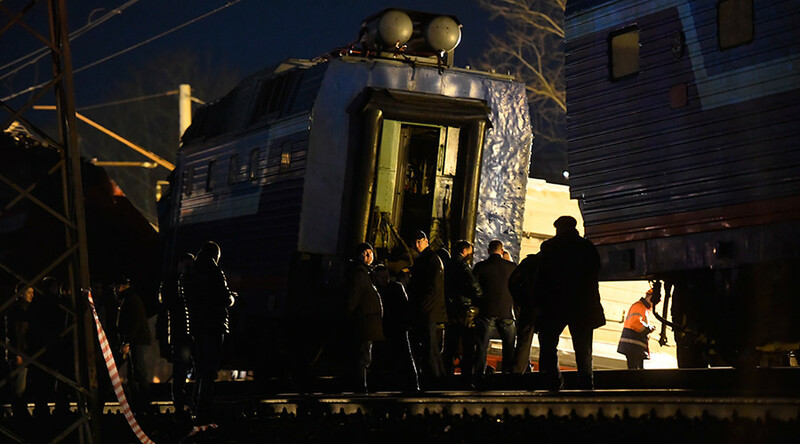 The Russian Investigative Committee said that a malfunction of the commuter train’s emergency brakes could have caused the incident. 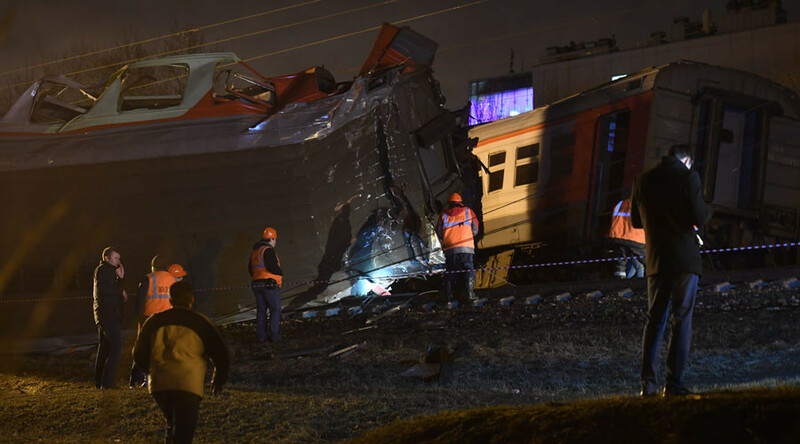 “At the moment [of the collision] 445 passengers and a train crew were on board a long-distance train, and the driver, his assistant and two ticket inspectors were on the commuter train,” said Investigative Committee spokesperson Tatyana Morozova, as cited by RIA Novosti. She added that among those hospitalized were the crew of the long-distance train and both ticket inspectors. Two Belarusian citizens are among the casualties, according to the country’s foreign ministry. Fire and rescue brigades were called to the scene to evacuate the passengers. About 170 rescuers have been working at the site of the incident. 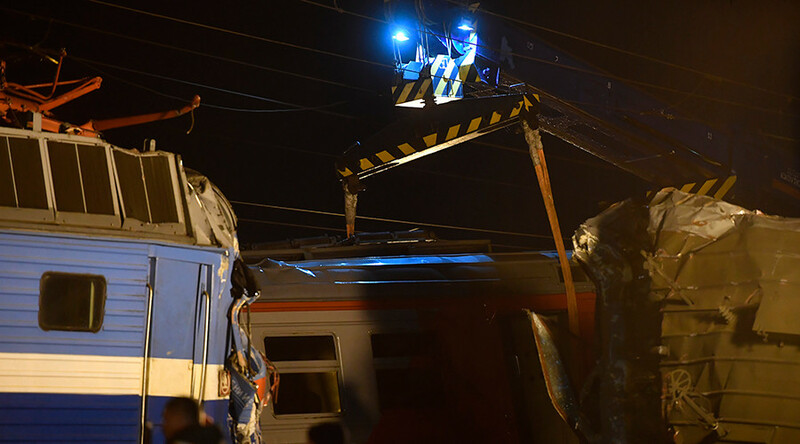 The trains collided at around 11:00pm on Saturday, and train services were suspended until 6:00am Sunday, Moscow time, the Emergencies Ministry reported. A special commission will be set up to investigate the circumstances that led to the collision, Sergey Zheltov, a Moscow Emergencies Ministry branch official, stated. The head of the ministry, Dmitry Puchkov, arrived at the crash site to oversee the work of the emergency services. Russia’s Investigative Committee has launched a probe into the incident. After questioning the train drivers, it stated that the initial version of events – that the train stopped to avoid hitting a man on the tracks – was found to be incorrect. The accident seems instead to have been caused by a malfunction of the commuter train’s emergency brakes, according to the statement. Russian President Vladimir Putin has ordered all necessary steps to remedy the situation, Kremlin spokesman Dmitry Peskov told journalists in Moscow. Meanwhile, a number of eyewitness reports emerged on Russian social media, with some people claiming that the commuter train, after using its emergency brakes, stood still for 20 minutes, with its lights off for around 10 minutes, before sliding down the slope and gaining speed. Three unconfirmed reports on the ‘Typical Odintsovo’ VKontakte group suggested that the train drivers were attempting to fix the brake malfunction, as passengers listened to their exchange via loudspeakers. “Everybody rushed to the first carriage. The driver repeatedly warned us to ‘hold on.’ The train developed quite a good deal of speed,” a subscriber of the group was cited as saying. The bang was “very strong,” an eyewitness told Moscow 24 TV. “We were standing in the vestibule and felt a sharp blow. Very strong. Several people were bruised, but without major injuries,” he said. A young woman named Yulia Kolomytseva filmed the collision from inside the train as it was sliding down the slope. The train driver warned the passengers of an imminent collision at least four minutes before it took place, the video reveals. “We are about to crash, our train is crashing,” Yulia cries out in the video, which was published on the social networking site VKontakte, moments before the carriage violently shakes and all the lights go out. Some people seemingly jumped off the train before the collision, with the woman saying she regretted not doing the same.